The Kiltale Hurling Club AGM 2019 will take place afterwards at 8.30pm (sharp). The club is asking for new members to please consider coming on board. KHC is a vibrant club but only because it has the help of its members. Our committee needs to grow and requires some new faces. The AGM is the meeting at which these events happen. So, please: we ask you, the people of the parish, to consider coming on board. If you wish to nominate any person for any position please contact secretary.kiltalehurling.meath@gaa.ie before the 31st January. Don’t forget to bring the kids to Trim, and to bring their hurls and helmets with them to take the pitch at half time! The Kiltale Hurling Club AGM 2019 will take place on Friday 8th Feb at 8.30pm (sharp). The club is asking for new members to please consider coming on board. KHC is a vibrant club but only because it has the help of its members. Our committee needs to grow and requires some new faces. The AGM is the meeting at which these events happen. So, please: we ask you, the people of the parish, to consider coming on board. National GAA Club Draw: Tickets for the 2019 National Club Draw are now on sale. There are 20 great prizes to be won. Tickets cost €10 and can be purchased from the Kiltale Hurling Club committee. All money raised by the club STAYS with the club, so please be generous! All Gym equipment has now been commissioned. IMPORTANT NOTE: All players, both hurling and camogie, must complete an induction and sign an induction sheet. Kiltale Hurling Club players, over 16, contact Peter Durnin. Kiltale Camogie Club players, over 16, contact Paddy Kelly. Until these procedures are completed, the gym is not to be used. The county board has issued a new fixtures planner for the first seven months of 2019, outlining exactly when fixtures are set to take place. It is available to download here. Coiste na nÓg has also issued its own fixtures planner for 2019, available here. Good luck to all from Kiltale and Moynalvey lining out for their county sides this weekend. PLEASE NOTE: Due to other circumstances the Kiltale Hurling Club AGM has had to be deferred. It was due to take place on Saturday 19th January but will now take place at a later date to be advised. Kiltale Hurling Club will have on sale, from 1st January, tickets for the 2019 National GAA Club Draw – 20 prizes to be won, including a brand new car! Tickets are €10 can be purchased from Kiltale Hurling Club Committee, etc. Kiltale Hurling & Camogie Club wish all club members and parishioners a healthy and happy 2019. We thank you all very much for all the support during 2018! The Senior Hurling Champions 2018 received their SHC medals, presented by Paddy Kelly Sr.The club wish to congratulate all on a great achievement ‘5 In A Row’ – To all associated with this honour in 2018 and before well done. To all who represent the club on the field of play, for both club and county, the best for 2019.To those officers of the club, and those who represent the club at county level, the best for 2019. Kiltale Camogie Club – Moynalvey Football Club – Moynalvey Ladies Football Club: The best to you all for 2019. Bingo resumes after Christmas on Tuesday 8th January at 8.30pm (sharp) in Kiltale Club House – great jackpot and prizes to be won nightly. All funds go to the Young At Heart Group. Kiltale Hurling & Camogie Awards Night TONIGHT! Meath GAA on Tuesday 30th announced that they were extending the date of the first draw to December 29th 2018. THAT’S TONIGHT! Dressing Rooms 1-4 – All works completed. It is hoped to unveil the new dressing rooms on January 19th. A very big thank you to Vinny Walsh Construction and his staff, FÁS, and all those that have volunteered their time in the recent weeks to assist in getting the development works competed, as well as on other works around the grounds. A huge effort by all concerned has this project completed by the end of the year. .
Kiltale Hurling & Camogie Club wish all club members and parishioners a very happy and peaceful Christmas, and a healthy and happy 2019. We thank you all very much for all the support during 2018! All tickets to be returned to the clubhouse before 19th December. Tickets for the 2019 National GAA Club Draw will be on sale from January 1st. 20 prizes to be won! Tickets (€10) can be purchased from Kiltale Hurling Club Committee etc. The GAA has published its latest club newsletter for December, which you can download here. 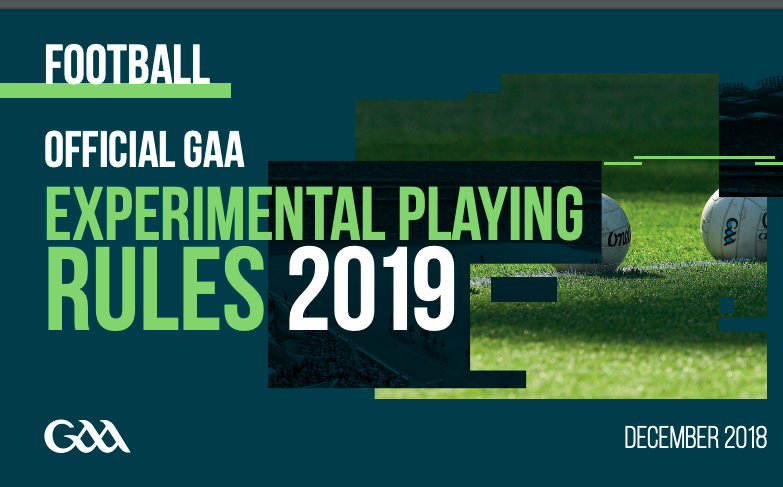 It has also today published a separate document explaining the experimental football rules which are in effect for the 2019 pre-season competitions, which you can download here.